Roaming Stamper: What a trip! I promised to post photos yesterday of my weekend but my weekend lasted a little longer! We didn't get into SLC until 11 p.m. and I was just too exhausted to upload photos, resize them, and write. So, I'm up this morning and am ready to show you some great pictures! 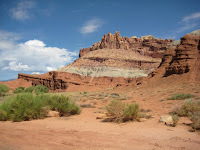 We spent Sunday at Capitol Reef National Park. This a an amazing part full of surprised around every corner. There were some petroglyphs but many were very faded and some defaced and there was also a register cliff of early settlers passing through. On top of that just breathtaking scenery as far as the eye could see. We enjoyed several hikes and did 3 different trails f or about a total of 10 miles. We saw a lot of wildlife and enjoyed probably one of the best apple pie we've ever had from a store in the park that was once a homestead. 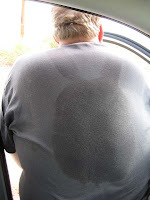 After our last hike, we went to get in the park and I looked at my hubby's back and just started cracking up. The sweat looked like a bunny rabbit! We both had a good laugh after I took the picture and showed it to him. It was an amazing day and we both really enjoyed this park. If you want to visit a National Park in the summer and avoid the huge crowds of people then I highly suggest this one. However, while in the area you really should visit Bryce, Zion, and Arches! I'm off to breakfast but will post later with pictures of our whirlwind day yesterday. Just a hint, it involves over 400 miles of driving but worth it!